Cass Junior High School, located in Darien, IL, is a 5th-8th grade building. The 8th grade advanced social studies class participated in this project under the guidance of the Library of Congress and Archive-It. The class consists of 18 diverse students and all represent the wide variety of interests and focuses of a typical young teenager in Chicagoland..
Dag Hammarskjold Middle School, generally referred to as Dag, is located on Wallingford’s east side, next to the Lyman Hall High School campus. Elementary feeder schools are: Moses Y. Beach, Pond Hill, Rock Hill, Stevens, and Yalesville..
Mount Dora High School, home of the “Hurricanes,” is located in the city of Mount Dora, Florida, approximately 30 miles northwest of Orlando, Florida. Ms. Straughan’s AP History class and Mr. Buell’s Economics classes are participating in this year’s Web Archiving Project. This is our first year archiving, and we are excited to be selecting and tagging web sites. In preparation for web archiving, we created an on-line file sharing site in “Moodle” to view and discuss the proposed web sites and to avoid duplication. Paul VI Catholic High School is located just outside of Washington D.C in Fairfax, Virginia. We’ve created the Webcrawlers Club to be part of this program. 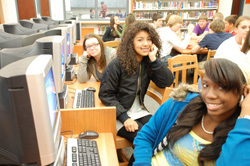 The club is student-run, with the school librarian serving as the advisor. Chosen sites are an eclectic mix recommended by Paul VI’s students. We have a lead student for each of our three collections, each of whom is in charge of the site descriptions for their collection. Our club members are proud to be the connection between the Paul VI community and the students of the future. The School District of Philadelphia is the eighth largest school district in the nation, by enrollment. Located in a historic and culturally rich setting, we are a racially and ethnically diverse community committed to education. We are students, parents, teachers, staff, and community members; we are the School District of Philadelphia..
Rocky Hill focuses on innovative teaching and an interactive educational experience that prepares students to become leaders and lifelong learners. Our diverse student body is challenged academically and afforded opportunities not found at any other schools. Rooftop is a K-8 public, alternative elementary school located in the center of San Francisco on two sites on the eastern slope of Twin Peaks. Our student population reflects the City’s diverse ethnic background. Programs in art, music, and drama are considered an integral part of the Rooftop experience. The Archive/Opera class at Rooftop’s Studio at Mayeda gives students the opportunity create both the “archives” (from Greek ta arkheia “public records,” and the “opera,” (the work). As we explore the school’s history, we make decisions about what we would like to archive and come together to create new works of art in the process.